"Evil Clown - evilrings Premium Silver Ring"
The pictures are taken from our prototype of this ring. They show how every ring will look like - the only detail missing is the evilrings logo that will be added on the inside. The evil clown from evilrings is outstanding. Impressive in size, extraordinary in design and featuring a maximum of details. The silver seems to come alive - it nearly looks as if we mounted a real skin on this ring. The ring band is carved and blackened all around. The teeth and many other details have been carved manually under a microscope and we use a multiple manual finnishing process for this ring. Every detail looks exactly like we want it to look and the evil smile makes up for the rest. This ring is not hollowed out - there only is an opening due to the wide open mouth. Even with this opening this rock weighs in impressive 45g - beeing all solid Sterling silver! We can't describe how this ring feels - you have to find out! Crafted by hand from solid Sterling silver. 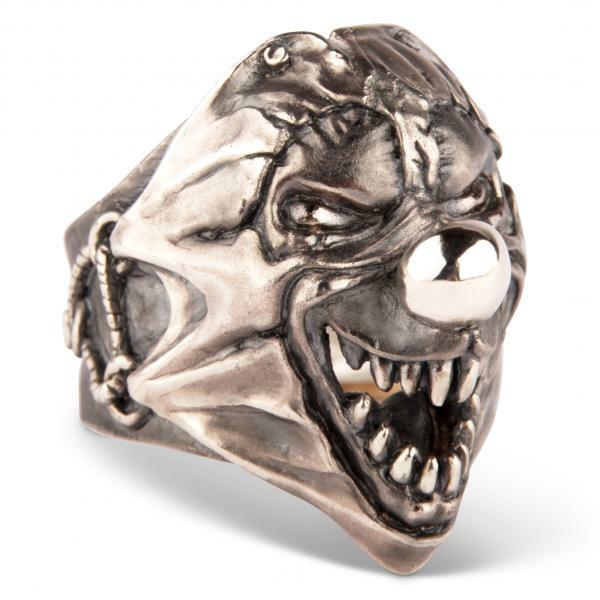 Customer evaluation for "Evil Clown - evilrings Premium Silver Ring"
Evaluations will be activated after verification. Your e-mail address will not be visible to anyone. We only use it for a double opt-in to protect our system from spam entries. Reliable worldwide shipping - always with insurance! Hassle-free returns, no questions asked! Support via e-mail or phone! Halfskull Ring Tribute to Keith. Goliath! - One Big Skull, Baby! Cuban 25 mm Sterling Silver Bracelet "Heavy"
Subscribe to our free evilrings newsletter!